Dr. D.Anthony traced the development of the steppe nomadism to find support for the Gimbutas-less M.Gimbutas theory, trying to re-incarnate it without nomadic invasion waves that were cardinal for the sustenance of the M.Gimbutas theory; for that, Dr. D.Anthony advocates a distinction between the steppe nomadic cultures of the Scythians, Mongols, Türks, Huns, and others, and the ”old” population of the steppes, which he does without a substantial analysis for a juxtaposition of the matching traits. The idea parallels the idea of enterprising European scientists of the past two centuries, who came up with a new concept that the European Scythians were not of the Türkic root, and manufactured linguistical ”proofs” of it flying in the face of reality and testimonies of the contemporaries. Dispelling the Türkic roots of the ”old” steppe population is a much steeper slope to climb, because coming up with linguistical ”proofs” is out of question, and the archeological, ethnological, anthropological, and biological materials reliably link the early pre-nomadic and nomadic cultures with their Türkic descendents. The Dr. D.Anthony's work is illuminating for the Türkic history, because it traces a litany of cultures and names assigned by modern local scholars to findings within their areal digs, and arranges them in a semblance of a chronological order. However, the picture remains too dim and far from clear. A flood of recent Western publications was devoted to re-analyzing archeological record with an objective to rebuilt the archeologist's M.Gimbutas linguistic theory on a new foundation, to preserve the N.Pontic as a cradle of Indo-European linguistic spread, and demonstrate its validity after the theory was devastated by the loss of its invasion foundation. An objective valuation of these labors was given by C.C.Lamberg-Karlovsky in his 2002 and 2005 publications, respectively: ”There is, however, no compelling archaeological evidence that they (Andronovo and Bactrian Margiana archaeological complexes ) had a common ancestor or that either is Indo-Iranian.” and ”Given the increasingly large number of divisions and subdivisions of the generic Andronovo culture(s), with evidence for ”no one group having undue prestige over the others,” there is neither reason nor evidence to believe that they all shared an Indo-Iranian language. From the common roots of the millennia-long Andronovo culture(s) [and before that the related Timber Grave culture(s)], processes of both convergence and divergence [archaeologically indicated by the eastward migrations of the Andronovo culture(s)] allow for the presence of not only the Indo-Iranian languages but for other language families as well, that is, Altaic and Uralic. Clearly, the convergence of cultures, that is, the assimilation of local populations by an in-coming peoples, is very poorly developed within the archaeological discipline.” Unless we unearth a talking individual and understand his presumably IE speech, the IE situation is promising to remain in suspence.Given that the M.Gimbutas theory and its reincarnations are largely built on nationalistic impulses, we should expect that they would linger for a long while, while the proponents try to overcome mounting obstacles and squeeze diminishing returns from the ambiguities of the less-studied materials. The deflation of typological methods and dating, and the advent of the instrumental analysis, dating and biological tracing are not helpful either, they tend to hit presumptive speculations at their most vulnerable spot, at the factual evidence; and that trend is exacerbated by the younger school of scholars, more apt in applying mathematical statistical methods and data base technologies to disciplines that used to abhor math and precise sciences, by the younger scholars who keep bringing up ever new aspects injurious to the old presumption. Accepted designation and spelling of the archeological cultures are shown in bold. Ukrainian name for the Sredny Stog (accepted English spelling) is Serednyi Stog (also found in literature). Non-author's comments and illustrations are noted in blue. Page numbers are shown in blue at the beginning of the page. The Eurasian steppe is a sea of varied grasslands extending from Mongolia to the mouth of the Danube, an east-west distance of about 7,000 kilometers. No surviving inscriptions describe the Bronze Age cultures of the steppe - they are entirely prehistoric. For that reason, they are much less well known than their descendants of the Iron Age, such as the Scythians. Unfortunately, the Bronze Age cultures tend to be seen through the lens of these later horse nomads and their historical cousins - Mongols, Turks, Huns, and others. In fact, horse nomadism of the classic Eurasian steppe type appeared after about 1000 BC. Before 1000 BC the steppe was occupied by quite different kinds of cultures, not at all like the Scythians. It was in the Bronze Age that people first really domesticated the steppe - learned to profit from it. Wagons, wool sheep, and perhaps horseback riding appeared in the steppe at the beginning of the Bronze Age. Chariots and large-scale copper mining arose in the Late Bronze Age. These innovations revolutionized steppe economies, which led to the extension of a single, broadly similar steppe civilization from eastern Europe to the borders of China. Indo-European languages might well have spread through this new community of steppe cultures. The steppe Bronze Age was defined by Soviet archaeologists, who did not look to western Europe for guidance. Instead, they matched the chronological phases of the Russian and Ukrainian steppes with those of the Caucasus Mountains - part of both the Czarist Russian empire and the Soviet Union. The Bronze Age chronology of the Caucasus, in turn, is linked to that of Anatolia, in modern Turkey. As a result, the steppe regions of the former Soviet Union have a Bronze Age chronology that is entirely different from that just to the west in Poland or southeastern Europe, where the western European chronological system defined by Paul Reinecke was used. The Early Bronze Age of the steppes began about 3300 BC, perhaps a thousand years earlier than the Early Bronze Age of Poland and southeastern Europe but about the same time as the Early Bronze Age of Anatolia. This might seem a trivial matter, but it has hindered communication between western and Russian-Ukrainian archaeologists who study the Bronze Age. In addition, some influential Soviet and post-Soviet archaeologists were slow to accept the validity of radiocarbon dating, so competing radiocarbon-based and typology-based chronologies have confused outsiders. Finally, the Bronze Age of the steppe covers such an enormous area that it is impossible to define one chronology that applies to the entire region. In fact, there was a significant cultural frontier in the Volga-Ural region that separated the western steppes, west of the Ural Mountains, from the eastern, or Asian, steppes until the end of the Middle Bronze Age, as defined in the western sequence. In the steppes of northern Kazakhstan, just east of this Ural frontier, the sequence jumps from a local Eneolithic to a brief and poorly defined Early Bronze Age (strongly influenced by the western Middle Bonze Age), followed by the Late Bronze Age. It is only in the Late Bronze Age that the eastern and western steppes share the same broad chronological periods. The sequence of Bronze Age cultures in the western steppes was established in 1901 - 1907, when Vasily A. Gorodtsov excavated 107 burial mounds, or kurgans, containing 299 graves in the Izyum region of the northern Donets River Valley, near Kharkov in the Ukrainian steppes. In 1907 he published an account in which he observed that three basic types of graves were found repeatedly, stratified one above the other: the oldest graves in the kurgans were of a type he called pit graves, followed by catacomb graves and then by timber graves. These grave types are now recognized as the backbone of the Bronze Age chronology for the western steppes. The absolute dates given to them here are maximal dates, the earliest and latest expressions. The period 4000 - 3500 BC witnessed the appearance of new kinds of wealth in the steppes north of the Black Sea (the North Pontic region) and, simultaneously, the fragmentation of societies in the Danube Valley and eastern Carpathians (the Tripolye culture) that had been the region's centers of population and economic productivity. Rich graves (the Karanovo VI culture) appeared in the steppe grasslands from the mouth of the Danube (as at Suvorovo, north of the Danube delta in Romania) to the Azov steppes (as at Novodanilovka, north of Mariupol in Ukraine). These exceptional graves contained flint blades up to 20 centimeters long, polished flint axes, lanceolate flint points, copper and shell beads, copper spiral rings and bracelets, a few small gold ornaments, and (at Suvorovo) a polished stone mace-head shaped like a horse's head. The percentage of horse bones doubled in steppe settlements of this period, about 4000 - 3000 BC, at Dereivka and Sredny Stog II. It is possible that horseback riding began at about this time. Early in this period, perhaps setting in motion economic and military innovations that threatened the economic basis of agricultural villages. 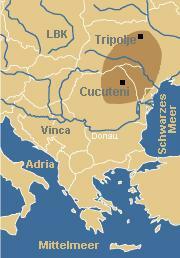 Most Tripolye (aka Cucuteni-Trypillian culture) B1 - B2 towns, dated about 4000 - 3800 BC, were fortified. In the Lower Danube Valley, previously a densely settled and materially rich region, six hundred tell settlements were abandoned, and a simpler material culture (typified by the sites Cernavoda and Renie) became widespread in the smaller, dispersed communities that followed. Copper mining and metallurgy declined sharply in the Balkans. Later, in the Southern Bug Valley, the easternmost Tripolye people concentrated into a few very large towns, such as Maidanets'ke, arguably for defensive reasons. The largest were 300 - 400 hectares in area, with fifteen hundred buildings arranged in concentric circles around a large central plaza or green. After about 3500 BC the North Pontic steppe cultures were drawn into a new set of relationships with truly royal figures who appeared in the northern Caucasus. Such villages as Svobodnoe had existed since about 4300 BC in the northern Caucasian piedmont uplands, supported by pig and cattle herding and small-scale agriculture. About 3500 - 3300 BC the people of the Kuban forest-steppe region began to erect a series of spectacularly rich kurgan graves. Huge kurgans were built over stonelined grave chambers containing fabulous gifts. Among the items were huge cauldrons (up to 70 liters) (later, a hallmark of Scythian, Hunnish, and Türkic nomadic cultures) made of arsenical bronze, vases of sheet gold and silver decorated with scenes of animal processions and a goat mounting a tree of life, silver rods with cast silver and gold bull figurines, arsenical bronze axes and daggers, and hundreds of ornaments of gold, turquoise, and carnelian. The kurgan built over the chieftain's grave at the type site of the Maikop culture was 11 meters high; it and the stone grave chamber (later, stone slab graves are traditional contraption found among most of the steppe pastoralists, from Scythians to Kipchaks) would have taken five hundred men almost six weeks to build. Maikop settlements, such as Meshoko and Galugai, remained small and quite ordinary, without metal finds, public buildings, or storehouses, so we do not know where the new chiefs kept their wealth during life (later, a portable treasury was a hallmark of the steppe nomads, one of the most publicized was the Khazar treasure train). The ceramic inventory, however, is similar in the rich graves and the settlements - pots from the Maikop chieftain's grave look like those from Meshoko. Some early stage Maikop metal tools have analogies at Sialk III in northwestern Iran, and others resemble those from Arslantepe VI in southeastern Anatolia (Kuro-Arax culture, Uruk civilization), sites of the same period. A minority of Maikop metal artifacts were made with a high-nickel-content arsenical bronze, like the formula used in Anatolia and Mesopotamia and unlike the normal Caucasian metal type of this era. Certain early Maikop ceramic vessels were wheel-thrown, a technology known in Anatolia and Iran but previously unknown in the northern Caucasus. The inspiration for the sheet-silver vessel decorated with a goat mounting a tree of life must have been in late-stage Uruk Mesopotamia, where the first cities in the world were at that time consuming trade commodities and sending out merchants and ambassadors. The appearance of a very rich elite in the northern Caucasus probably was an indirect result of this stimulation of interregional trade emanating from Mesopotamia. Wool sheep had been bred first in Mesopotamia in about 4000 BC The earliest woolen textiles known north of the Caucasus were found in a rich Maikop grave at Novosvobodnaya, dating perhaps to 2800 BC Wool could shed rainwater and take dyes much better than any plant-fiber textile. Portable felt tents and felt boots, standard pieces of nomad gear in later centuries, became possible at this time. Wagons also might have been invented in Mesopotamia. Wagons with solid wooden wheels began to appear at scattered sites across southeastern Europe after the Maikop culture emerged in the northern Caucasus. The evidence for the adoption of wagons can be seen at about 3300 BC in southern Poland (as evidenced by an incised image of a four-wheeled wagon on a pot of the Funnel Beaker culture), 3300 - 3000 BC in Hungary (seen in small clay wagon models in Baden culture graves with ox teams), and 3000 BC in the North Pontic steppes (as indicated by actual burials of disassembled wagons with solid wheels in or above human graves). We do not know with certainty that wool sheep and wagons both came into the steppes through the Maikop culture, but other southern influences certainly are apparent at Maikop, and the timing is right. Numerous Maikop-type graves under kurgans have been found in the steppes north of the northern Caucasian piedmont, and isolated Maikop-type artifacts have been discovered in scattered local graves across the North Pontic region. The Pit Grave culture arose in the North Pontic steppes about when the earliest Maikop mounds were built - 3300 BC, more or less. According to the classic 1979 study of Nikolai Merpert, the Pit Grave began in the steppes of the lower Volga, northwest of the Caspian Sea, and the funeral customs that define the Pit Grave phenomenon then spread westward to the Danube. Merpert also divided Pit Grave into nine regional variants, however, and the relationships between them have become increasingly unclear since 1979. The oldest Pit Grave pottery types defined by Merpert, egg-shaped shell-tempered pots with cord and comb - impressed decoration, clearly evolved from the late-stage Khvalynsk and Repin ceramic types found in the Volga and Don steppes in the earlier fourth millennium BC. Pots such as these also are found in some Pit Grave graves farther west in Ukraine. Most Pit Grave graves in Ukraine, however, contained a variety of local pottery types, and some of them could be older than those on the Volga. Pit Grave was not really a single culture with a single origin - Merpert used the phrase ”economic-historical community” to describe it. A more mobile residence pattern would have been encouraged by the appearance of wagons, felt tents, and woolen clothes. Wool made it easier to live in the open steppe, away from the protected river valleys. Wagons were a critically important innovation, because they permitted a herder to carry enough food, shelter, and water to remain with his herd far from the sheltered river valleys. Herds could be dispersed over much larger areas, which meant that larger herds could be owned and real wealth could be accumulated in livestock. It is no accident that metallurgy picked up at about the same time - herders now had something to trade. Wagons acquired such importance that they were disassembled and buried with certain individuals; about two hundred wagon graves are known in the North Pontic steppes for the Early Bronze Age and Middle Bronze Age combined (Etiologically, horse, wagon, and boat are transportation means, for the deceased to reach the other world, likewise the kurgans are pastures needed for that travel, and food dishes are supplies for the travel. These attributes remained practically unchanged from the 3500 BC to essentially the present. They demonstrate the opposite of the concept that Dr. D.Anthony advocates, a break from the N.Pontic nomadic culture and the later ”Mongols, Turks, Huns, and others”, they demonstrate an interrupted continuity between the N.Pontic nomadic culture and the historical cultures that start with the Huns. The best known manifestation of that belief is the famous kurgan of the Chinese monarch. The underlying religious doctrine has been extensively studied and documented. Another evidence of uninterrupted continuity is that the later nomads immediately recognized kurgans for what they are, and used them as portable pastures for their own deceased, as so-called secondary burials. The practice of secondary burials continued into the Middle Age, until a switch to Islam, or a population replacement by IE Slavs who traditionally did not hold to this system of beliefs. To safeguard the necessities for the deceased's travel from the grave robbers, the most enticing trophies, like wheels, swords, and boats, were either rendered unusable, or symbolic imitation substitutes were furnished). The wagons, the oldest preserved anywhere in the world, were narrow-bodied and heavy, with solid wheels that turned on a fixed axle. Pulled laboriously by oxen, they were not racing vehicles (If that can be projected backwards, in later days arose an industry of make-belief objects, especially for the most valuable objects like cauldrons, when a substitute smaller, simpler, less valuable cauldrons were produced in the shops as imitated funerary goods, so that the family cauldron could remain in the family. If the old cauldron was worn out or broken, the family would deposit the old cauldron, and replace it with a new one for themselves. For horses, a skin, and even a part of a horse, symbolized a bona fide riding mount. Likewise, the wagons, at least some of them, could be replacement wagons made in advance to order, to spare the real valuable coach, and among Germanic people were used symbolic boats). Pit Grave herders probably rode horses; characteristic wear made by a bit has been found on the premolars of horse teeth from this period in a neighboring culture in Kazakhstan (the Botai culture), where there are settlements with large numbers of horse bones. Horseback riding greatly increased the efficiency of herding, particularly cattle herding. A few western Pit Grave settlements are known in Ukraine. At one of them, Mikhailovka level II, 60 percent of the animal bones were from cattle. A study of animal sacrifices in the eastern Pit Grave region (the Don-Volga-Ural steppes), however, found that among fifty-three graves with such animal bones, sheep occurred in 65 percent, cattle in only 15 percent, and horses in 7.5 percent of the graves (For funeral feasts). The seeds of wheat and millet have been found in the clay of some Pit Grave pots in the lower Dnieper steppes (Belyaevka kurgan 1 and Glubokoe kurgan 2), so some agriculture might have been practiced in the steppe river valleys of Ukraine (Depending on the area, millet was a staple nomadic food, in a form of rare soup, or cornbread. In the Late Middle Age, millet in the cornbread was replaced with maize corn, which remains a signature meal called ”mamalyga” in Rumania and neighboring areas, before that the millet cornbread was a staple in southern nomadic and neighboring areas. Millet cornbread is known to be a Sarmat staple). Local sandstone copper ores were exploited in two apparent centers of metallurgic activity: the lower Dnieper and the middle Volga. Some exceptionally rich graves are located near the city of Samara on the Volga, at the northern edge of the steppe zone. One, the Pit Grave grave at Kutuluk, contained a sword-length pure copper club or mace weighing 1.5 kilograms, and another, a Pit Grave-Poltavka grave nearby at Utyevka, contained a copper dagger, a shaft-hole axe, a flat axe, an L-headed pin, and two gold rings with granulated decoration. Dozens of tanged daggers are known from Pit Grave graves. A few objects made of iron are present in later Pit Grave graves (knife blades and the head of a copper pin at Utyevka), perhaps the earliest iron artifacts anywhere. Beginning in about 3000 BC rich cultures emerged in the coastal steppes of the Crimea (the Kemi Oba culture) and the Dniester estuary northwest of the Black Sea (the Usatovo culture). They might have participated in seaborne trade along the Black Sea coast - artifact exchanges show that Usatovo, Kemi Oba, and late stages of the Maikop cultures were contemporary. Perhaps their trade goods even reached Troy I. A stone stele much like a Pit Grave marker was built into a wall at Troy I, and the Troy I ceramics were very much like those of the Baden and Ezero cultures in southeastern Europe (The stele is consistent with philological and mythological evidence that Troy was an outpost of Türkic settlement in Anatolia). The Early Bronze Age settlement and cemetery at Usatovo, on a shallow coastal bay near the mouth of the Dniester, is the defining site for the Usatovo culture. Two separate groups of large kurgans were surrounded by standing stone curbs and stelae, occasionally carved with images of horses. In the central graves of kurgan cemetery 1 adult men were buried with riveted arsenical copper daggers and beautifully painted pots of the final-stage Tripolye C2 type, probably made for Usatovo chiefs in the last Tripolye towns on the upper Dniester. A few glass beads have been uncovered in Usatovo graves, and some Usatovo riveted daggers look like Aegean or Anatolian daggers of the same period; these objects suggest contacts with the south. The Middle Bronze Age began at different times in different places. The earliest graves assigned to the Catacomb culture date to perhaps 2800 - 2700 BC and are located in the steppes north of the northern Caucasus, among societies of the Novotitorovskaya type that were in close contact with late Maikop culture, and in the Don Valley to the north. Along the Volga, graves containing Poltavka pottery appeared by 2800 - 2700 BC as well; Poltavka was very much like the earlier eastern Pit Grave culture, but with larger, more elaborately decorated, flat-based pots. By about 2600 - 2500 BC Catacomb traditions spread westward over the entire North Pontic region as far as the mouth of the Danube. Poltavka persisted through the Middle Bronze Age in the Volga-Ural region. The Catacomb culture made sophisticated arsenical bronze weapons, tools, and ornaments, probably using Caucasian alloying recipes. Northward, on the Volga, the Poltavka culture continued to use its local ”pure” copper sources, rather than the arsenical bronzes of the south. T-shaped pins of bone and copper, perhaps hairpins, were a common late Pit Grave-Catacomb type. Many metal shaft-hole axes and daggers were deposited in graves. The same kinds of ornate bronze pins and medallions are evident in the Middle Bronze Age royal kurgans of the northern Caucasus (Sachkere, Bedeni, and Tsnori) and the settlements of the Caspian Gate (Velikent) on the one hand and the Middle Bronze Age sites of the steppes on the other. These finds imply an active north-south system of Middle Bronze Age trade and intercommunication between the steppes and the Caucasus. Evgeni N. Chernykh, a specialist in metals and metallurgy, has speculated that up to half of the output of the Caucasian copper industry might have been consumed in the steppes to the north. Wagon burials continued in the Catacomb region for exceptional people. In the Ingul valley, west of the Dnieper, as well as in the steppes north of the Caucasus, some Catacomb graves contained skeletons with clay death masks applied to the skull. Although the Middle Bronze Age remained a period of extreme mobility and few settlements, the number of settlement sites increased. A few small Middle Bronze Age occupation sites are known even on the Volga, a region devoid of Early Bronze Age settlements. A Catacomb culture wagon grave in the Azov steppes contained a charred pile of cultivated wheat grains, so some cultivation probably took place. The emphasis in the economy seems to have remained on pastoralism, however. Near Tsatsa in the Kalmyk steppes north of the North Caucasus, the skulls of forty horses were found sacrificed at the edge of one a man's grave (Tsatsa kurgan 1, grave 5, of the Catacomb culture). This find is exceptional - a single horse or a ram's head is more common - but it demonstrates the continuing ritual importance of herded animals. At the end of the Middle Bronze Age, about 2200 - 2000 BC, the innovations that would define the Late Bronze Age began to evolve in the northern steppes around the southern Urals. Perhaps increasing interaction between northern steppe herders and southern forest societies brought about this surge of creativity and wealth. Domesticated cattle and horses had begun to appear with some regularity at sites in the forest zone by about 2500 - 2300 BC, with the appearance and spread of the Fatyanovo culture, a Russian forest-zone eastern extension of the Corded Ware horizon. Fatyanovo-related bronzeworking was adopted in the forest zone west of the Urals at about the same time. In the forest-steppe region, at the ecological boundary, the Abashevo culture emerged on the upper Don and middle Volga. The Abashevo culture displayed great skill in bronzework and was in contact with the late Poltavka peoples in the nearby steppes. During the Middle Bronze Age some late Poltavka people from the Volga-Ural steppes drifted into the steppes east of the Ural Mountains, crossing the Ural frontier into what had been forager territory. About 2100 - 2200 BC, these Poltavka groups began to mix with or emulate late Abashevo peoples, who had appeared in the southern Ural forest steppe. The mixture of Abashevo and Poltavka customs in the grassy hills west of the upper Tobol River created the visible traits of the Sintashta-Arkaim culture. It is more difficult to explain the explosion of extravagant ritual sacrifices and sudden building of large fortified settlements. Sintashta-Arkaim sites are found in a compact region at the northern edge of the steppe, where the stony, gently rising hills are rich in copper ores. All of the streams in the Sintashta-Arkaim region flow into the upper Tobol on its west side. The known settlements of this culture were strongly fortified, with deep ditches dug outside high earth-and-timber walls; houses stood close together with their narrower ends against the wall. Before it was half destroyed by river erosion, Sintashta, probably contained the remains of sixty houses; Arkaim had about the same. Smelting copper from ore and other kinds of metallurgy occurred in every house in every excavated settlement. Outside the settlements were kurgan cemeteries containing extraordinarily rich graves, accompanied by socketed spears, axes, daggers, flint points, whole horses, entire dogs, and the heads of cattle and sheep. Chariots were found on the floors of sixteen graves of the Sintashta-Arkaim culture, continuing the ritual of vehicle burial that had been practiced in the western steppes, but with a new kind of vehicle. Three chariot burials at Krivoe Ozero and Sintashta are directly dated. They were buried between about 2100 and 1900 BC, which makes them the oldest chariots known anywhere in the world. There is some technical debate about whether these were true chariots: Were they too small, with a car just big enough for one person? Were the wheels too close together - 1.1 - 1.5 meters across the axle - to keep the vehicle upright on a fast turn? Were the hubs too small to maintain the wheels in a vertical position? These interesting questions should not obscure the importance of the technical advance in high-speed transport represented by the Sintashta-Arkaim chariots. They were light vehicles, framed with small-diameter wood but probably floored in leather or some other perishable material that left a dark stain, with two wheels of ten to twelve wooden spokes set in slots in the grave floor. They were pulled by a pair of horses controlled by a new, more severe kind of bit cheekpiece and driven by a man with weapons (axe, dagger, and spear). The new chariot-driving cheekpiece design, an ovoid antler plate with interior spikes that pressed into the sides of the horses' lips, was invented in the steppes south of the Urals. It spread from there across Ukraine (through the Mnogovalikovaya culture, which evolved from late Catacomb culture) into southeastern Europe (the Glina III/Monteoru culture) and later into the Near East (graves at Gaza and Hazor). It is possible that chariotry diffused in the same way, from an origin in the steppes. Alternatively, perhaps chariots were invented in the Near East, as many researchers believe (Since Near East did not have horses, their chariots could only be donkey carts, of questionable utility). The exact origin is unimportant. What is certain is that chariots spread very quickly, appearing in Anatolia at Karum Kanesh by about 1950 - 1850 BC, so close in time to the Sintashta culture chariots that it is impossible to say for certain which region had chariots first. The Sintashta-Arkaim culture was not alone. Between about 2100 and 1800 BC, Sintashta-Arkaim was the easternmost link in a chain of three northern steppe cultures that shared many funeral rituals, bronze weapon types, tool types, pottery styles, and cheekpiece designs. The middle one, with perhaps the oldest radiocarbon dates, was on the middle Volga - the Potapovka group. The western link was on the upper Don - the Filatovka group. The Don and Volga groups had no fortified settlements; they continued the mobile lifestyle of the earlier Poltavka era. This small cluster of metal-rich late Middle Bronze Age cultures in the steppes around the southern Urals, between the Don and the Tobol, had a tremendous influence on the later customs and styles of the Eurasian Late Bronze Age from China to the Carpathians. The Late Bronze Age Timber Grave horizon grew out of the Potapovka-Filatovka west of the Urals; east of the Urals, the Late Bronze Age Petrovka-Alakul horizon grew out of Sintashta-Arkaim. Many archaeologists have suggested that Sintashta-Arkaim might represent the speakers of Indo-Iranian, the parent language from which Sanskrit and Avestan Iranian evolved. The excavator of Arkaim, Gennady Zdanovich, has speculated that the prophet Zoroaster was born there. Political extremists, Slavic nationalists, and religious cultists have made the site a sort of shrine. These late Middle Bronze Age Don-Tobol cultures need no such exaggeration. As the apparent source of many of the traits that define the Late Bronze Age of the Eurasian steppes, they are interesting enough. At the beginning of the Late Bronze Age, about 1850 - 1700 BC, people across the northern steppes began to lead much more sedentary, localized lives. Permanent timber buildings were erected at settlements where tents or wagons had been used before, and people stayed in those buildings long enough to deposit thick middens of garbage outside and around them. These sites are so much easier to find that settlement sites spring into archaeological visibility at the start of the Late Bronze Age as if a veil had been lifted; they cover a strip of northern steppe extending from Ukraine to northern Kazakhstan. A few Middle Bronze Age potsherds usually are found among the thousands of Late Bronze Age potsherds at Timber Grave sites in the western steppes, suggesting that the same places were being used but in new and quite different ways. We are not sure what that difference was - the nature of the Late Bronze Age economy is fiercely debated. In the eastern steppes, east of the Urals, the Late Bronze Age witnessed the spread of the Andronovo horizon (1800 - 1200 BC) from Petrovka-Alakul origins. Most Andronovo culture settlements were in new places, which had not been occupied during the preceding Eneolithic, but then the Andronovo horizon represented the first introduction of herding economies in many places east of the Urals. Timber Grave and Andronovo shared a general resemblance in their settlement forms, funeral rituals, ceramics, and metal tools and weapons. We should not exaggerate these resemblances - as in the Early Bronze Age Pit Grave phenomenon, this was a horizon or a related pair of horizons, not a single culture. Still, it was the first time in human history that such a chain of related cultures extended from the Carpathians to the Pamirs, right across the heart of the Eurasian steppes. Almost immediately, people using Andronovo-style pots and metal weapons made contact with the irrigation-based urban civilizations at the northern edge of the Mesopotamian-Iranian world, in northern Afghanistan and southern Turkmenistan - the Bactria-Margiana civilization - and also with the western fringes of the emerging Chinese world, in Eatern Turkistan (orig. : Xinjiang) and Gansu. These contacts might have started at the end of the Middle Bronze Age, about 2000 BC, before the Andronovo culture proper began, but they continued through the early Andronovo stages. Once the chain of Late Bronze Age steppe cultures grappled with these civilizations to the east and south, Eurasia began to be, tenatively, a single interacting world (The date of 2000BC is a much earlier date for western influences in China, which are commonly dated by 1,200BC, when a flood of innovations swept through Chinese principalities). We have much to learn about exactly how the Timber Grave and Andronovo economies worked. Some western Timber Grave settlements in Ukraine have yielded cultivated cereals, but the role of agriculture farther east is debated. One study of an early Timber Grave settlement in the Samara River valley, east of the Volga, yielded evidence that the site was occupied year-round, or at least cattle were butchered during all seasons of the year. Intensive botanical study recovered not a single cultivated grain, however, and the caries-free teeth of the Timber Grave people buried in a nearby kurgan testify to a low-carbohydrate diet (The caries-free teeth sounds like an important trait, apparently intensively ignored, since it does not show up in the studies and reports). Waterlogged sediments from the bottom of a well at this site, Krasno Samarskoe, yielded thousands of charred seeds of Chenopodium, or goosefoot, a wild plant. At least in some areas, then, permanent year-round settlements might have been supported by a herding-and-gathering economy, with little or no agriculture. During the Late Bronze Age copper was mined on an almost industrial scale across the steppes. Particularly large mining complexes were located in the southern Urals, at Kargaly near Orenburg, and in central Kazakhstan, near Karaganda. The raw copper ore, the rock itself, seems to have been exported from the mines. Smelting and metalworking were widely dispersed activities; traces are found in many Timber Grave and Andronovo settlements. Andronovo tin mines have been excavated in the Zerafshan valley near Samarkand. True tin bronzes predominated in the east, at many Andronovo sites, while arsenical bronzes continued to be more common in the west, at Timber Grave sites. Humans gave a portion of their herds and well-crafted verses of praise to the gods, and the gods, in return, provided protection from misfortune and the blessings of power and prosperity. ”Let this racehorse bring us good cattle and good horses, male children, and all-nourishing wealth,” pleaded a Sanskrit prayer in book 1, hymn 162, of the Rig Veda. It goes on, ”Let the horse with our offerings achieve sovereign power for us.” This relationship was mirrored in the mortal world when wealthy patrons sponsored public funeral feasts in return for the approval and loyalty of their clients (To state that public funeral feasts served the interests of the rulers is totally out of wack. Every funeral was accompanied by a funeral feast, from lowest to highest in the society, and by their nature they all were public, when the whole clan, tribe, village gathered for the funerals. Some funerals were more lavish then others, but the intent of the lavishness was to provide a better conditions for the trip to the other world, not to grab control or power, which could not have been grabbed in a mobile dispersed society. The sacrifices were a part of the prayer ritual, whether private and local, or annual-semiannual formal rituals, and though formal rituals manifested an increased level of responsibility for the wellbeing of the extended community, they did not protect the ruler from slaughter when calamities fell on the people, and they sought a scapegoat. A murder of an unfortunate ruler and election of more fortunate ruler was an ingrained nomadic tradition, well documented by their contemporaries). The Indic and Iranian poetry of the Rig Veda and Avesta offers direct testimony of this kind of system. The people received spectacle with their meat - they witnessed an elaborately scripted sacrifice punctuated by poems full of drama, rich in emotion, occasionally bawdy and earthy, and filled with clever metaphors and triple and double meanings. The best of these verbal displays were memorized, repeated, and shared, and they became part of the collective medium through which a variety of different peoples ended up speaking Indo-Iranian languages across most of the Eurasian steppes (And this is a pure nonsense, we do not have any evidentiary material to see the nomadic religion as an engine of ethnical consolidation; quite the opposite, while the Chinese, Türkic, and Mongolic religion of Almighty Sky was shared, their ethnicities, including their linguistic affiliation, remained largely untouched, and mutual influences passed through without impacting their languages. In respect to the Chinese vernaculars, they are mutually incomprehensible, and any hymn memorized in one Chinese language would remain a mystery for another to this day. It appears that induction of a local monolingual phenomenon to the Eurasian space populated by dispersed heterolingual peoples is not applicable. Assigning a Kulturtreger role to the Avestan hymns as analogous to assigning Kulturtreger role to Catholic Latin or Islamic Arabic: neither one converted Germans and others into Italians, or Persians and others into Arabs). ”Let us speak great words as men of power in the sacrificial gathering,” said the standard closing line attached to several different hymns in book 2, one of the oldest parts of the Rig Veda, probably composed about 1500 BC This line expresses very well the connections among language, public ritual, verbal artistry, and the projection of secular power. A tradition that had begun in the western steppes thousands of years earlier, with simpler animal sacrifices, developed by the Late Bronze Age into a vehicle for the spread of a new kind of culture across the Eurasian steppes (This induction goes against simple facts, like that African Egyptians and Yucatan Maya did not need Türkic Timber Grave to come up with an idea of a sacrifice. Who herds crocodiles, sacrifices crocodiles, who herds horses, sacrifices horses, and who sows millet, sacrifices millet. One fact is clear: only the Germanic branch of the IE family has lactose tolerance, the other two main branches, Romance and Indo-Iranian, suffer lactose intolerance, and correspondingly only one branch of the IE family had exposure to the animal husbandry rooted in the Timber Grave. Ditto for the kurgan cemeteries.). See also Domestication of the Horse (vol. 1, part 4). Anthony, David W. ”Horse, Wagon, and Chariot: Indo-European Languages and Archaeology.” Antiquity (1995): 554 - 565. - - . ”The 'Kurgan Culture,' Indo-European Origins, and the Domestication of the Horse: A Reconsideration.” Current Anthropology 27, no. 4 (1986): 291 - 313. Chernykh, E. N. Ancient Metallurgy in the USSR: The Early Metal Age. Translated by Sarah Wright. Cambridge, U.K.: Cambridge University Press, 1992. Kuzmina, Elena E. ”Stages of Development of Stockbreeding Husbandry and Ecology of the Steppes in the Light of Archaeological and Paleoecological Data.” In The Archaeology of the Steppes: Methods and Strategies. Edited by Bruno Genito, pp. 31 - 71. Napoli, Italy: Instituto Universitario Orientale, 1994. - - . ”Horses, Chariots and the Indo-Iranians: An Archaeological Spark in the Historical Dark.” South Asian Archaeology 1 (1993): 403 - 412. Lamberg-Karlovsky, C. C. ”Archaeology and Language: The Indo-Iranians.” Current Anthropology 43, no. 1 (2002): 75 - 76. Mair, Victor H., ed. The Bronze Age and Early Iron Age Peoples of Eastern Central Asia. Washington, D.C.: Institute for the Study of Man, 1998. Mallory, James P., and Victor H. Mair. The Tarim Mummies: Ancient China and the Mystery of the Earliest Peoples from the West. New York: Thames and Hudson, 2000. Rassamakin, Yuri. ”The Eneolithic of the Black Sea Steppe: Dynamics of Cultural and Economic Development 4500 - 2300 BC” In Late Prehistoric Exploitation of the Eurasian Steppe. Edited by Marsha Levine, Yuri Rassamakin, Aleksandr Kislenko, and Nataliya Tatarintseva, pp. 59 - 182. Cambridge, U.K.: McDonald Institute for Archaeological Research, 1999. Telegin, Dimitri Y., and James P. Mallory. The Anthropomorphic Stelae of the Ukraine: The Early Iconography of the Indo-Europeans. Journal of Indo-European Studies Monograph, no. 11. Washington, D.C.: Institute for the Study of Man, 1994. 14C пре-Скифская и Скифская эпоха в Евроазии 3,000 до н.э - 50 н.э. Северо-Понтийские Скифы 7 в. до н.э. От Хун до Булгар 6-15 в. н.э.